Fruit salsas scream summer. 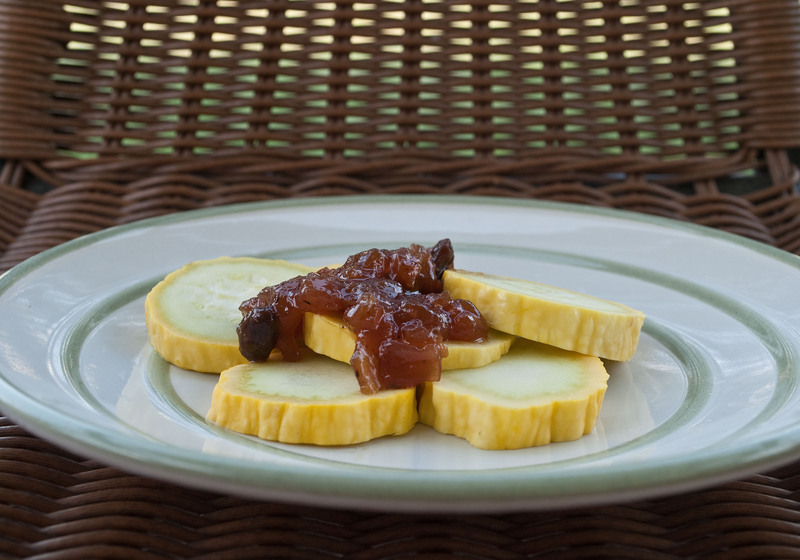 I love the combo of sweet peaches and mangoes with spicy peppers, and it goes well with more than just tortilla chips. 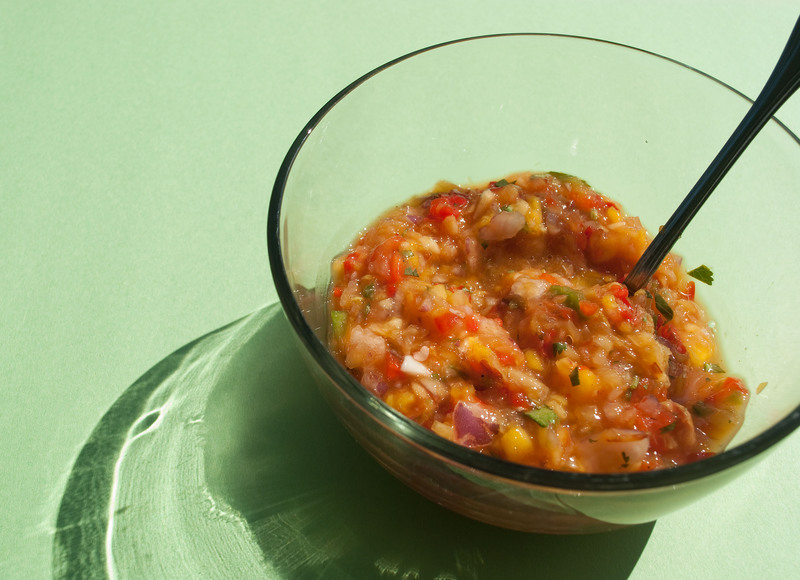 Try this salsa on grilled chicken or pork, or as a dip for mild vegetables like squash. I like salsa spicy enough to make my nose run, so if that’s a little too hot for you, remove the seeds from the jalapenos before you add them, or just cut down on the amount of peppers you use. One more thing — I didn’t peel the peaches for this recipe, although you are certainly welcome to. It’s kind of a pain, but if you want to go the extra mile, check out my peach-peeling instructions at the bottom of this post. I don’t mind a little peach fuzz, and once everything’s mixed up you don’t even notice it. If I was cooking the peaches I’d peel them, but for this recipe it’s not necessary. Combine all ingredients in a large bowl and mix well. Chill at least an hour before eating. 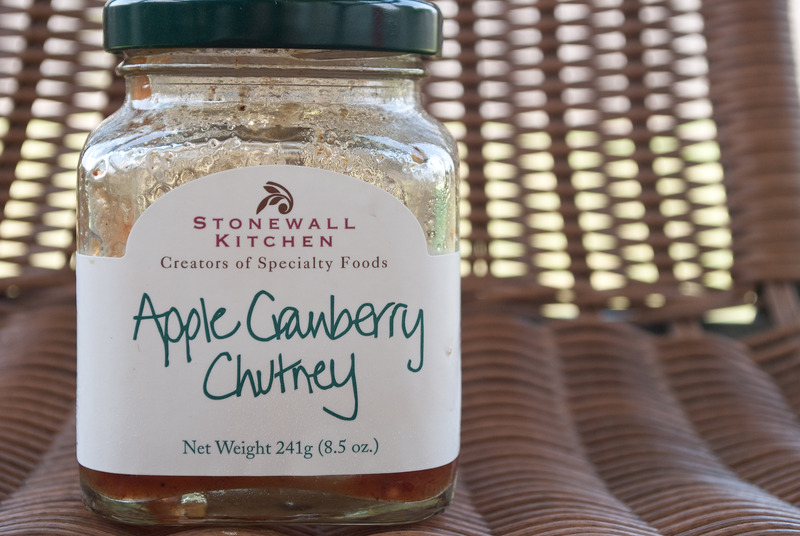 You can eat it right away, but chilling for a little bit lets the flavors combine nicely. Bring a pot of water to boil. Meanwhile, use a sharp knife to cut an X on the bottom of each peach. Fill a large bowl with ice water. When the water reaches a boil, drop the peaches in and let them boil for 45 seconds. Remove with a slotted spoon and immediately drop into the ice water. 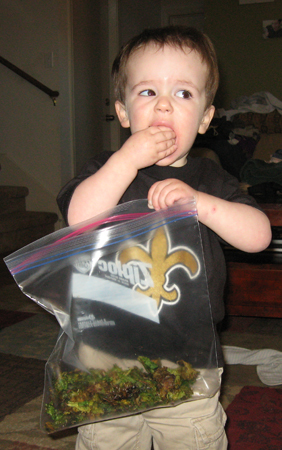 Wait a few minutes until you can handle them, then peel. The skin will start to pull away at the X you cut, and it’ll slide right off. 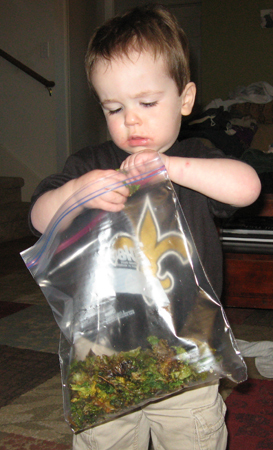 This recipe was born out of practicality. 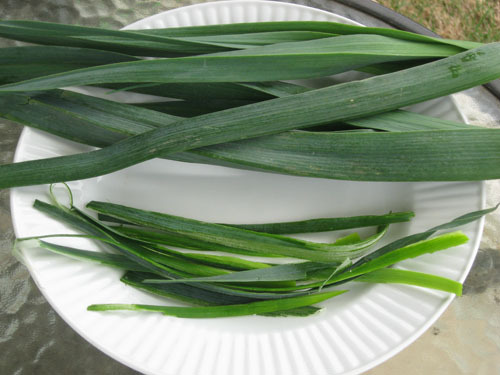 I hate wasting anything, especially food, and leek greens have always bothered me because they aren’t very useful, but they’re twice as big as the part of the leek you actually use and I hate throwing them away. Now that I have my compost bin, I feel a little better about throwing food scraps in it because I know they’ll become useful in my garden at some point. Still, when I got three giant leeks in my box this week, I couldn’t help trying to figure out something to do with the greens. They’re stringy and tough, but I still wondered if they could serve some sort of ancillary, possibly decorative function, in a dish. And then it hit me: they’re stringy, so what if I could figure out some way for them to tie something together? I put a ruler by it so you could see how big it is, but I had to back up so far to get the entire thing in the picture that you can’t read the numbers. It’s more than 2 feet long, and made up of extremely thin, smaller-than-a-pencil thin stalks. I’m used to bigger stalks I can stuff with peanut butter and cheese and the like, so these guys were throwing me for a loop. 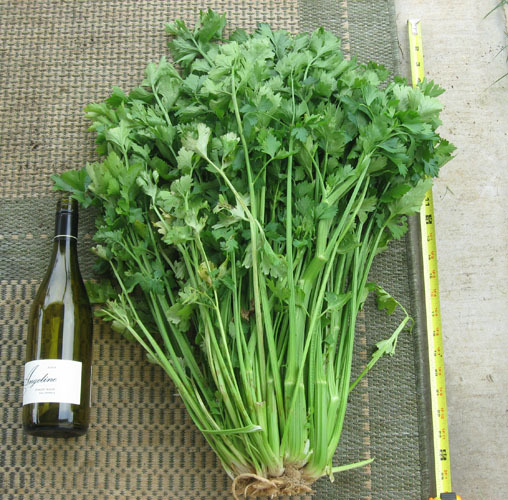 I mean, sure, you can chop them up and use them like grocery store celery, but where’s the fun in that when you have two feet of celery to use up? 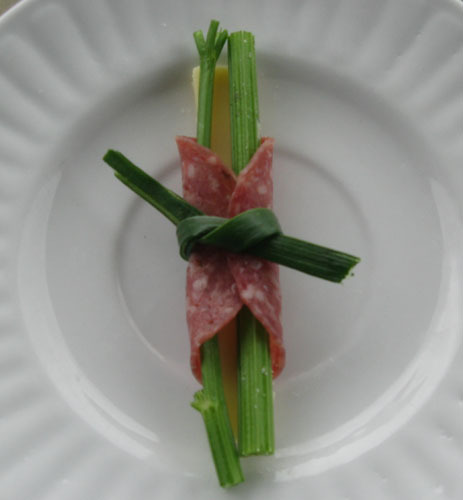 After making a few of these, I found that I liked them better when I used bite-sized pieces of cheese and celery, and cut the salami in half to fold around them. 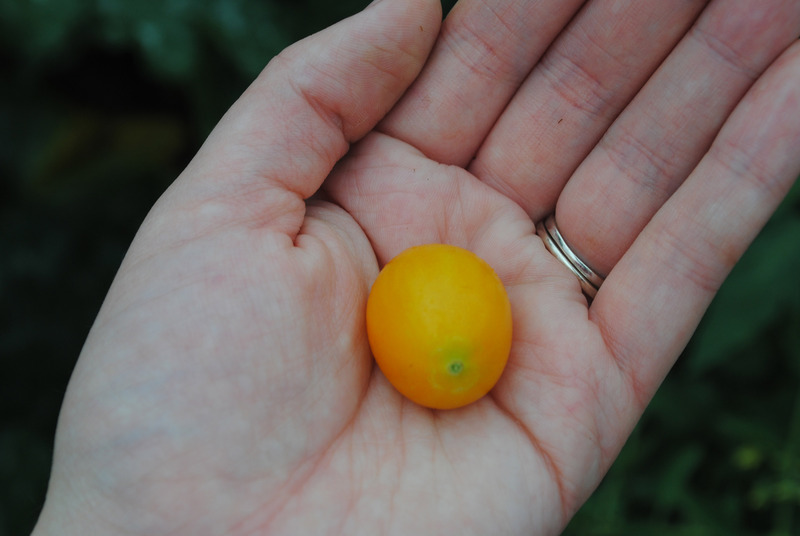 The celery can be stringy, so it’s easier to eat if you make these small enough to pop in your mouth in one bite. Note: You can use any mix of hard cheese and meat you want for this recipe. I wouldn’t use soft or crumbly cheeses, like Brie or goat cheese, because they’ll fall apart. I imagine manchego and serrano ham would be good, or even chunks of parmesan with prosciutto. Also, I’m not going to give specific amounts for each ingredient here, because you can really make as many or as few as you want based on how much meat, cheese, celery, and leek you have. 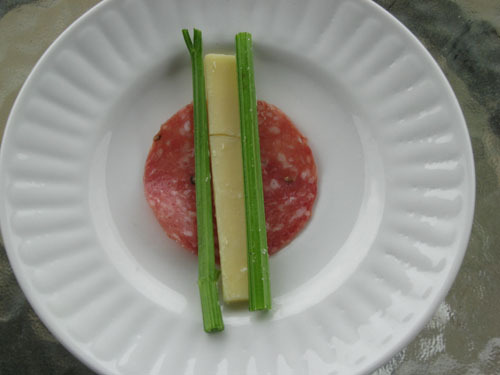 Arrange a piece of celery and a piece of cheese on top of a slice of salami. 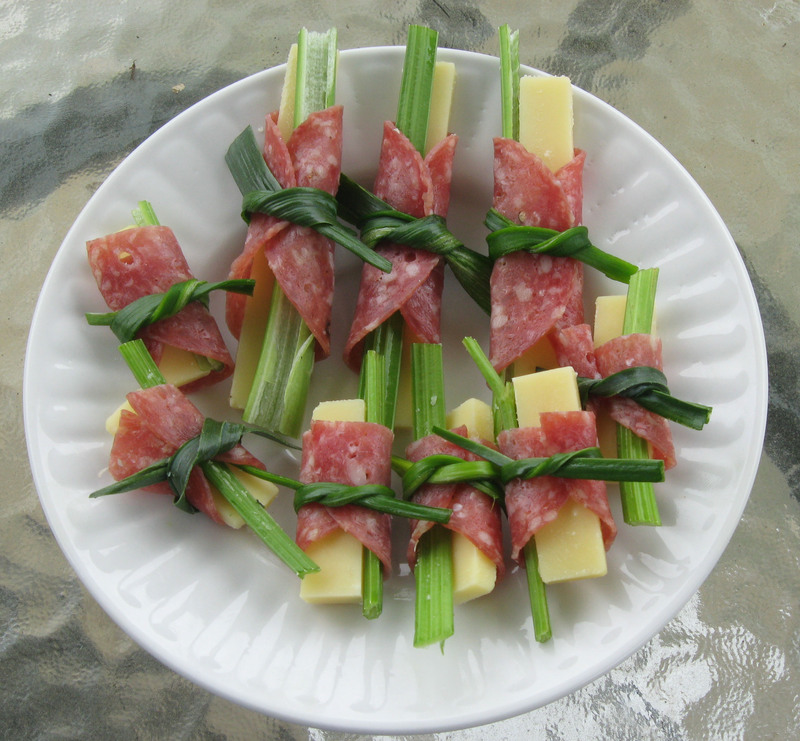 Slip a leek green under the meat and tie celery, cheese, and salami together to form a bundle. Repeat to form as many as your heart desires. 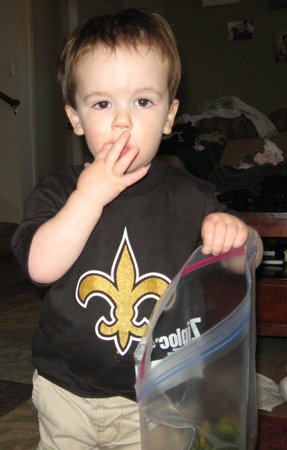 When a 20-month-old shovels in a vegetable in the manner you see above, you know you have a keeper. Here is Kath’s recipe. I like to add plenty of salt, pepper, and grated parmesan cheese, and then coat the kale pieces with cooking spray before baking. It’s much easier to coat them evenly this way (as opposed to drizzling with olive oil). Below is how I make them. Preheat oven to 375 degrees. Coat two baking sheets with cooking spray. 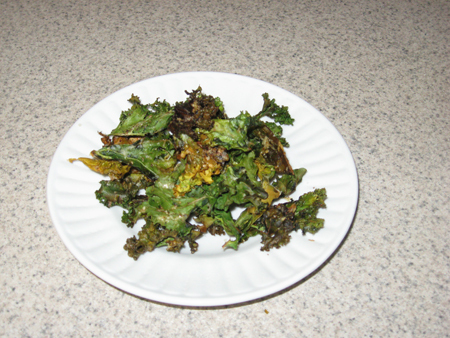 Tear kale into bite-sized pieces, removing the tough stems. Put kale on baking sheets, trying not to overlap the pieces, and coat with cooking spray. Sprinkle with salt, pepper, and cheese. Bake 13-15 minutes, until pieces are browned and crisp. Yum!